It just makes sense to save water and energy while the operator is away from the work area. That's why the Salvajor Scrap Collector ™ , Pot/Pan Collector ™ , ScrapMaster® and Pot/Pan ScrapMaster ® now come standard with Patented Operator Sensing Technology* . The technology is also available for our ARSS and ARSS-LD controlled disposers. 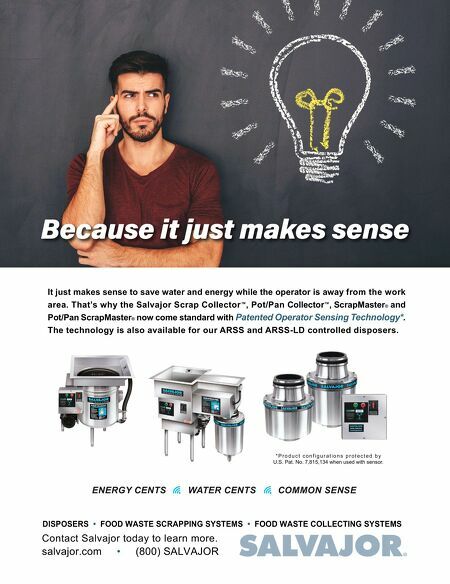 ENERGY CENTS WATER CENTS COMMON SENSE Because it just makes sense DISPOSERS • FOOD WASTE SCRAPPING SYSTEMS • FOOD WASTE COLLECTING SYSTEMS Contact Salvajor today to learn more. salvajor.com • (800) SALVAJOR * P r o d u c t c o n f i g u r a t i o n s p r o t e c t e d b y U.S. Pat. No. 7,815,134 when used with sensor.